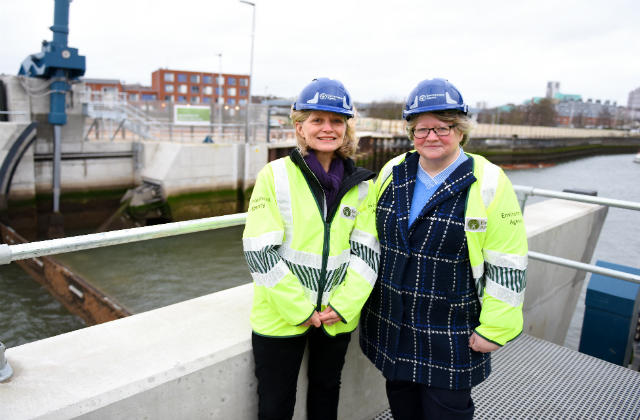 On Friday 8 February, Floods Minister, Thérèse Coffey officially opened Ipswich’s new tidal barrier. Costing almost £70 million, the new flood defences will better protect more than 1,600 homes and 400 businesses from flooding and the impacts of climate change over the course of the next century. The opening of new defence has been positively covered by regional and trade media including BBC News online, ITV News Anglia, BBC Look East, BBC Radio Suffolk, Ipswich Star, Heart FM Online, Town 102, Ipswich 102, New Civil Engineer and Business Green. 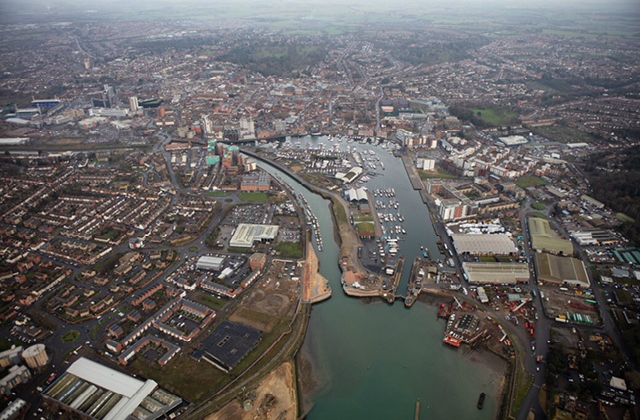 This important new flood scheme, which has received nearly £55 million of government funding, over 80% of the total cost, will better protect over 1,600 homes in Ipswich from tidal flooding over the next 100 years. The scheme will also secure the future of hundreds of local businesses whilst creating 4,000 jobs to boost the town’s economy. I am delighted the Government is investing so significantly in the county town of Suffolk and its future prosperity. The new flood defences centrepiece is a 200-tonne rotating barrier which can be raised in minutes, giving Ipswich a much higher level of protection from the type of North Sea tidal surge which threatened the town in 2007 and 2013. Climate change means increasing storms and rising sea levels all over the world. This flood scheme will help people and businesses prosper in a more resilient Ipswich over the course of the next century. The Environment Agency worked closely with the local community, the council and businesses to design and build a scheme that provides a greater level of protection for the town. It’s an important step forwards for our six year, £2.6 billion flood investment across the whole country. The opening event was attended by a number of representatives from project partners, including Ipswich Borough Council who helped to fund the scheme, the Ministry of Housing, Communities and Local Government, the Haven Gateway Partnership, and the New Anglia Local Enterprise Partnership. There has been coverage in The National over the weekend about Geographical Indications (GIs) – schemes that legally protect the names of regional specialty foods – should we leave the EU without a negotiated deal. From Scottish smoked salmon to Scotch Whisky, there are currently over 80 GIs in the UK and we’ve been clear, including in guidance published last week, that all UK GIs, and their unique heritage, will be protected here in the event of a no deal Brexit. And while we know our GI scheme needs to be UK-wide to be compatible with World Trade Organisation rules, no decisions have yet been made on how GIs would be labelled. It is completely untrue to say GI protections will be lost when we leave the EU. We’ve already set out how our schemes will work here and been clear existing UK products registered under EU GI schemes, from Scotch Whisky to Stornoway Black Pudding, will automatically get UK GI status. GIs are very important to the UK, both culturally and economically and by safeguarding GI status we will ensure that these brands, and the areas they evoke and represent, will maintain their global appeal. As well as clearly setting out that we will establish specific GI schemes to protect UK GIs in the future, we’ve also introduced a new civil sanctions regime to improve enforcement of Protected Food Name products. This will help local authorities to recover the costs of enforcement action on misuse of Protected Food Names.